The surname Vertigan is relatively rare and research shows that its origin is found in the County of Norfolk, England. The actual spelling of the name has varied over the centuries and records support several variations including Virtigan, Vertegans, Vardigans amongst others. 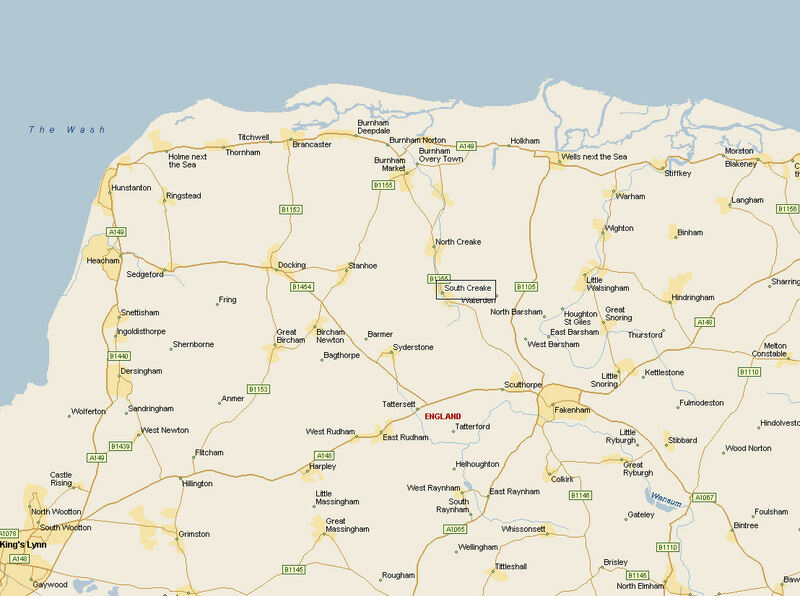 The map below shows several of the villages in Norfolk where Vertigan families lived. The first known person bearing this name in England was Peter Vertegans who died on 24th March 1633 at Norwich. All persons throughout the world today appear to be descendants of Peter and besides those in Britain other clans extend to USA and Canada and Australia where numerous families are found. Evidence exists that supports the fact that he was not born in England and it is probable he originated somewhere in Western Europe possibly Holland or Belgium. The transcript of Peter Vertegans will of 1634 is shown below from which several names are mentioned providing vital evidence of his family. My interest in the Vertigan names is through my grandmother Ellen who married John Frederick Lawson in Leeds in 1900. 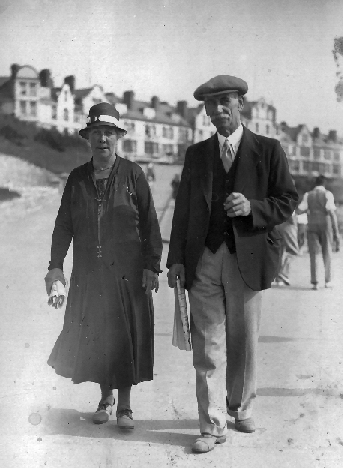 The photo below shows them on holiday in Bridlington, Yorkshire in 1933. This page will be extended in due course with more information and records will be made available. The Lawson births database for England and Wales has been extensively updated to include much more detail especially the names of parents and census reference numbers. All on-line Vertigan databases have been updated. The Cheesbrough UK census database has been updated to include results from the 1939 Register. The Cheesbrough births database for England and Wales has been updated to include much more detail especially the names of parents and census reference numbers. The UK census database has been updated and now contains 56,550 individuals. The database has also been extended to include details of the 1939 Register. The Lawson marriage database for England and Wales has been updated to include much more detail especially the names of spouses and census reference numbers. The US census database has received a major update, the total now covering 42,000 Lawson names. The on-line searchable database available to those who have posted details of their Lawson family has also been updated. The Lawson US births database has been extended with an additional 2973 Virginia State entries. The US State census file has been updated showing the numbers of Lawson entries found in individual years. The US marriage database has been updated with additional 1890 Texas entries and now totals 30,231 records. The UK Census database now totals 55,409 individuals and the US census database 40,015. The on-line databases will be updated in due course. 479 Tennessee Lawson births have been added to the database. The UK Lawson wills database has been extended to include 2900 wills between 1973 and 1995. There is a new item on the Site Navigation Panel containing details of The Lawson Letters issues by the late Mary Alice Lawson. I have added issues from this publication which are available to senior members who have posted details of their Lawson families. The Lawson Scottish marriages database has been extended with an additional 2481 entries and now covers male marriages between 1855-1959 and females between 1855-1939. The Lawson Scottish births database has been updated with entries for females covering 1920-1999 with 4,323 additional names. The Lawson Scottish births database has been updated with entries for males now covering 1855-1999 with 2,420 additional names. The Lawson Canadian census database has been updated and now contains 4,200 names. The Lawson wills database has been extended to include 1027 Scottish entries between 1876 and 1936. The Miscellaneous baptisms database has been updated with an additional 785 entries from Lancashire. An additional 511 entries have been added to the Lawson Wills UK database which now covers up to 1945. Additional Irish wills have also been added. An additional 700 Lawson baptisms and marriages have been added to the on-line searchable databases covering the Isle of Man. These can be located in the UK Baptism and UK Miscellaneous Marriage databases. The Lawson births database for England and Wales has been updated to include 1837-2006 with over 61,300 entries. The searchable on-line database site has changed to a different server. Please refer to the Searchable Database link in the Site Navigation Panel for the new site address. The Lawson deaths database for England and Wales has been updated and now extends to 2005 with 41,231 entries. A new database of Lawson deaths in USA has been added with 5,80 entries. This is available only to Senior Members who have posted some details in one of the site Forums. An additional 3,684 new births have been added to the US database available only to Senior Members who have posted details of their Lawson families.